Hearthstone’s new world champion is Taiwanese player tom60229, who defeated US player Fr0zen in an upset to take home $250,000 in prize money. After going down 0-2 in the first rounds, tom came back to win three in a row over Fr0zen, who had been favored to win after an impressive performance throughout the rest of the tournament. Want to dive in? Check out the best Hearthstone decks for beginners. Chen “tom60229” Wei Lin got a bit of a premature celebration, though, when somebody hit the button for the confetti launcher in the middle of the grand finals. 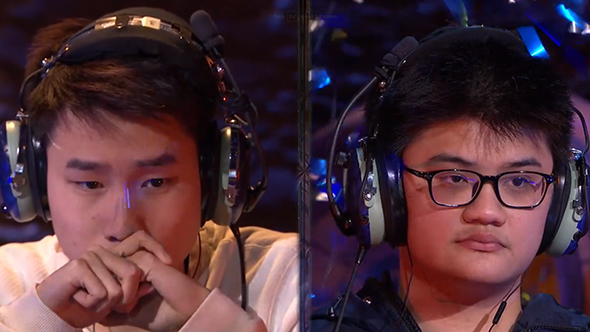 Both he and Frank “Fr0zen” Zhang remained composed during the gaffe, and the hilarity of their intense expressions as early confetti rains down cannot be overstated. Fr0zen’s Jade Druid deck served him well throughout most of the tournament in Amsterdam, proving an effective counter to the strategies of most of the other players. Yet tom managed to pull through and score the victory. The Taiwanese victor had competed once before in the World Championships back in 2014, but was swept out in the opening rounds. We can only imagine that the early confetti led tom60229 to victory.